Dentists are regularly telling patients that the mouth is a window to the rest of the body. That means your dentist in Waco is in a unique position to catch signs of other conditions. Pale, swollen, or inflamed gums can all inform your dentist of what is likely happening in the rest of your body. To learn what these symptoms mean, keep reading. While this is more common among patients who don’t brush or floss regularly, it can still occur for those who do practice daily oral care. According to your dentist, if your gums are red or sore even after brushing and flossing, it could be a sign of type 2 diabetes. This is caused by excess glucose in saliva bathing your gums. Bacteria feeds on this glucose. From there, your dentist will likely recommend you see a doctor for a physical exam and have blood tests performed. If your gums are swollen, there’s a chance it could be your medications causing it. This may especially be the case if you take medications for seizures, epilepsy, or high blood pressure. These medications can make the gums puffy, and therefore more vulnerable to bleeding when brushing. This is why it’s so important to tell your dentist about new medications you’re taking. From there, they’ll recommend you switch medications or give your gums extra care at home. They may also suggest that you come in for cleanings and exams more often. 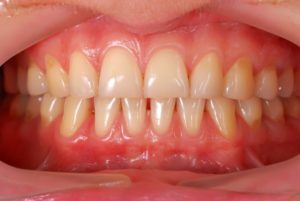 Healthy gums should have a pink appearance; not too red and not too pale. If your gums are pale, it may mean that your body isn’t producing enough red blood cells due to anemia. To fix this problem, try including more nutrients in your diet like iron and B12. Along with pale gums, you may also experience dizziness, fatigue, and general weakness. Consider eating foods like ground beef and spinach to up your nutrient intake. Receding gums are a sign of periodontal disease, according to your dentist in Waco. He may mention that your gums have formed pockets, leaving them more vulnerable to infection. Your teeth may also begin to loosen. This chronic inflammation puts you at a higher risk of developing breast cancer, so make sure you pursue periodontal therapy to mitigate your overall health risks. A white spot on your gums can easily be a canker sore, but your dentist is always skeptical. A white or red patch or lump can easily be oral cancer. Keep in mind that canker sores don’t confirm oral cancer is present, but when paired with other symptoms of oral cancer (i.e. difficulty chewing, swallowing, or hoarseness) then your dentist will likely order a biopsy to confirm if cancer is present. By visiting the dentist every six months, you can prevent gum disease and stay on top of your overall health. Schedule a visit with them today! Dr. Rick Cofer earned his Doctor of Dental Surgery degree from the Baylor School of Dentistry. Since then, he’s been associated with Texas Advanced Dental Seminars and the Seattle Study Club for over five years. To learn more about his practice, contact him at (254) 732-0309 or visit his website.